The oil and gas sales model relies heavily on relationships and the “Good ol’ boy network.” As a result, the industry has traditionally been a laggard in adopting new technologies and data solutions to deliver best practice demand generation. evolve. 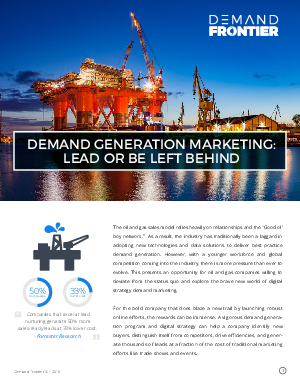 This presents an opportunity for oil and gas companies willing to deviate from the status quo and explore the brave new world of digital strategy demand marketing. For the bold company that does blaze a new trail by launching robust online efforts, the rewards can be immense. A vigorous demand generation program and digital strategy can help a company identify new buyers, distinguish itself from competitors, drive efficiencies, and generate thousands of leads at a fraction of the cost of traditional marketing efforts like trade shows and events.